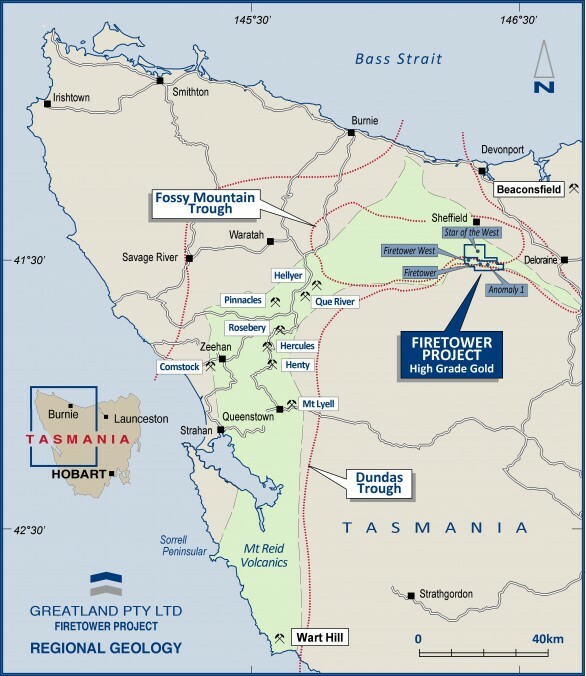 Located just 65km west of Launceston and 35km south of Devonport in northern Tasmania, the Firetower project consists of 62sq km of stratigraphically equivalent Mt. Read Volcanic Sequence rocks. 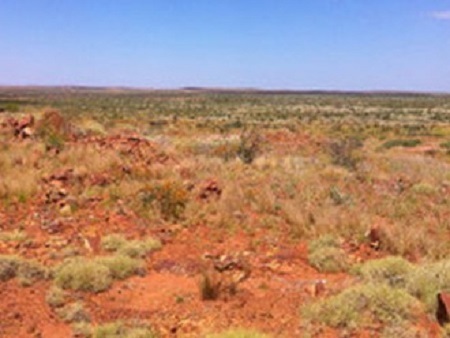 Firetower consists of one 100% owned tenement with gold and copper targets within approximately 12km of strike of prospective rocks throughout the area. Its location provides excellent infrastructure and access to a skilled local labour force. 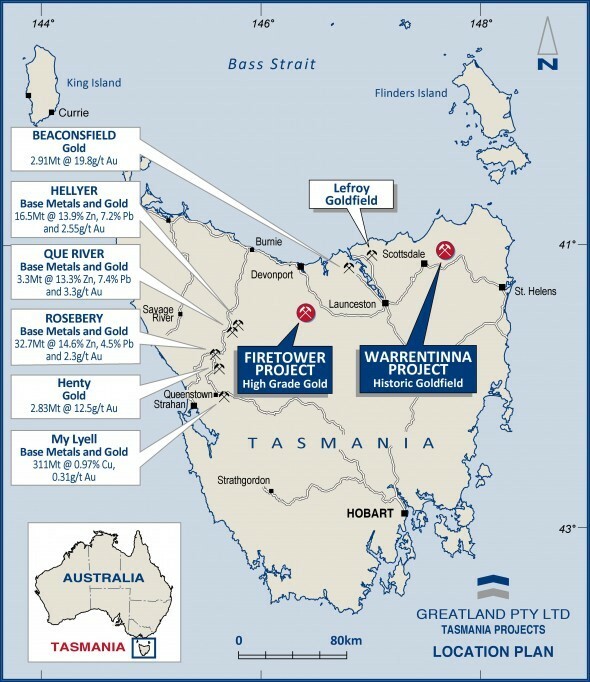 Gold mineralisation at Firetower was first located in the late 1970s with stream sediment samples up to 320g/t gold (+10 oz) but this was not followed up until the early 1990s with reconnaissance drilling. More modern exploration by Greatland and JV partners has included soil geochemistry to 4,450ppb gold, diamond drilling and detailed ground magnetics. 29m at 2.39g/t, 17m at 5.37g/t (incl 1m at 30g/t), 10m at 6.2g/t, 3m at 21.38g/t Au, 11m at 4.3g/t, 1.2m at 14.9g/t. Copper intercepts include 5m at 0.76% Cu, 1m at 1.44%, 3m at 0.62%, 2m at 0.84% and 0.5m at 3.72%. Drilling to date has, in general, tested approximately 250m of strike to a depth of around 100m from surface. Several other prospects are present within the project area such as Firetower West and Firetower East. At Firetower West soil geochemistry has delineated a large copper/arsenic/gold anomaly over an area of 800m x 300m, with rock chips up to 3.3% copper. A 3DIP target approximately 800m x 400m was tested with a single core hole in 2014 returning 1m at 1.34% copper and 2.6g/t silver. 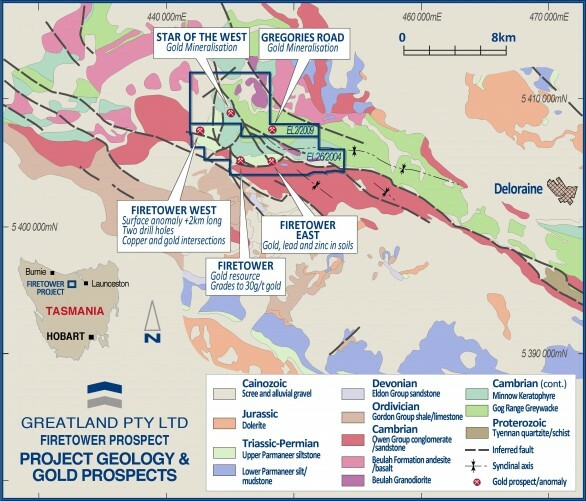 This is considered significant as it highlights the prospectivity of Firetower West to potentially host polymetallic deposits such as Hellyer and Roseberry. Firetower East is the eastern strike extensions of the main mineralised rocks at the Firetower prospect. This zone covers more than 2km of strike with soil geochemistry up to 150ppb gold, but little follow-up work has been completed here. A detailed review of the Firetower project was undertaken including all historic and Company geophysics and drill data with reinterpretation and 3D modelling undertaken. 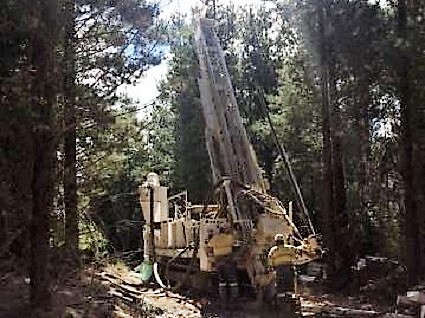 This highlighted the presence of untested surface gold mineralisation immediately west of the main Firetower prospect with soil geochemistry results including 390ppb gold and 210ppb gold, and rock chip results up to 3.57g/t gold. 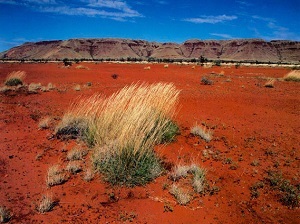 This area has been overlooked in the past as scree cover largely masks bedrock geology. 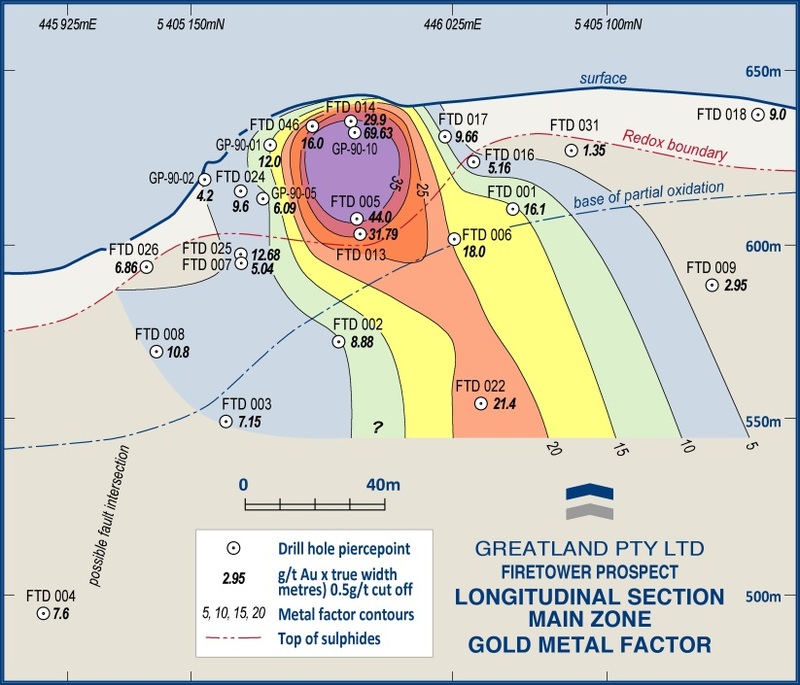 Early ground geophysics provides incomplete coverage over the Firetower prospect but shows an Induced Polarisation (IP) chargeability anomaly consistent with gold mineralisation intersected in existing drill holes. 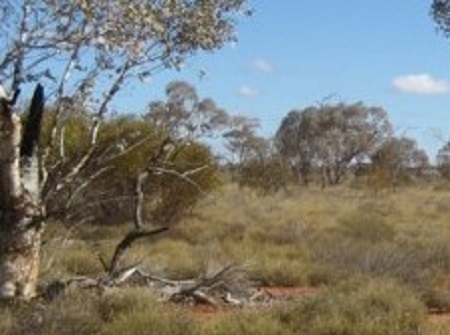 Extension of the IP coverage with modern geophysical equipment and processing techniques is considered a powerful tool to assist in significantly extending the strike potential of the gold mineralised system at Firetower. 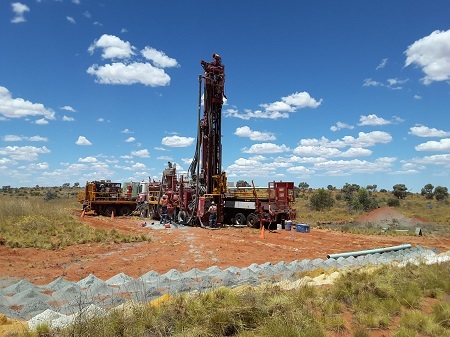 A comprehensive 3DIP survey for the Firetower prospect covering a strike length of 1.6km over the immediate mineralised zone at Firetower and high priority target areas to the immediate west and east was completed in 2018. Actual ground conditions and petrophysical parameters resulted in the collection of high quality IP data allowing the production of robust 3D chargeability, conductivity and resistivity models via modern inversion techniques. This resulted in the production of excellent 3D models which highlight a large gold target, approximately 1,000 metres long, traversing east-west across the Firetower prospect, which is open to the east and up to depths of 400 metres. Significantly, the results illustrate that the existing sub-surface gold mineralisation identified in drilling to date is spatially associated with the 3DIP chargeability anomaly. The 3D model of the chargeability anomaly highlights a potential plunge of mineralisation which allows the Company to focus on areas within the broader mineralised system which may potentially host higher grade gold and copper mineralisation. The chargeability anomaly is seen to depths of approximately 400m from surface. Drilling and 3DIP has tested only a small portion of the targeted 4km strike length area. The zone of gold mineralization identified to date is open in all directions. The Company’s exploration target for the Firetower prospect is 1 million ounces of gold. 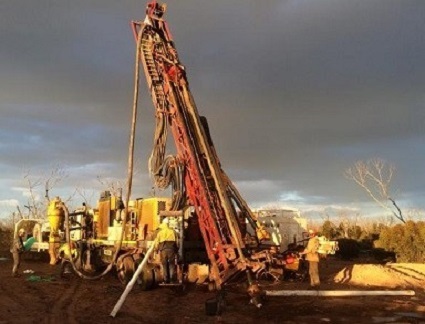 Geophysics and early ground reconnaissance has identified over 40km of strike to the east and west of the drilled area with potential for gold and copper deposits. These are yet to be fully tested. Gold mineralisation is associated with widespread alteration of volcaniclastic rocks, within stockworks of fine quartz-carbonate veining & sulphide content, including chalcopyrite, of 2-5% with highs of 30%. Alteration is dominated by silica, carbonate and pyrite. Local infrastructure is good with sealed and formed roads, power, water, accommodation, communications and numerous regional supply points. A skilled local workforce is accessible from the many nearby regional centres.